Network server for MoneyWorks Gold, with single company or multi-company options. All the functionality of MoneyWorks Gold with high performance networking for up to 99 simultaneous users. Enjoy the convenience of centralised data management, concurrent client licensing, remote access, powerful APIs, and automatic backups and archives. Datacentre provides convenient, scalable, and easy to manage network access for your MoneyWorks Gold data. The Datacentre Console provides a central, convenient way to manage your system. Fast access, even over the internet. MoneyWorks Datacentre has highly optimised networking and server-side operations, which, coupled with the powerful database engine, provide extremely fast remote connections without the need for expensive thin client solutions. Datacentre also minimises network traffic by providing server-side functionality for reporting and complex searches. 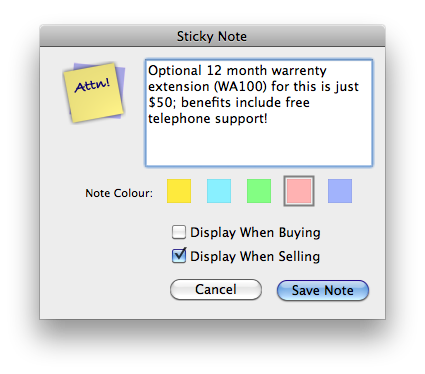 Example: a typical small business remote office scenario, with a user in Auckland, New Zealand, connecting to a Datacentre hosted on a Mac Mini in Wanaka, a distance of about 1500km (900 miles). Sort 29,792 item records by description: less than 1 second. Sort 29,792 item records by unit price: less than 1 second. Preview Profit & Loss Comparison report for month: about 2 seconds (2 pages). Preview six month Ledger report: about 30 seconds (71 pages). Note: A standard ADSL2 connection was used in Auckland, and a VDSL in Wanaka, giving an average ping time of about 55ms. Advanced security keeps your data safe. MoneyWorks Datacentre incorporates enhanced security for your protection. Provision to encrypt your data connections using SSL. Provision to secure REST services using SSL. Extensive per-user password access and privilege controls at the file level. MoneyWorks Audit trails keep track of who entered which transaction. Automatic daily backup and monthly archiving of data-files for added peace of mind. Datacentre has the convenience, scalability, and interoperability opportunities of a dedicated, multi-user server1. Allow other users to simultaneously access your accounting data. Single company and multi-company sharing options available. 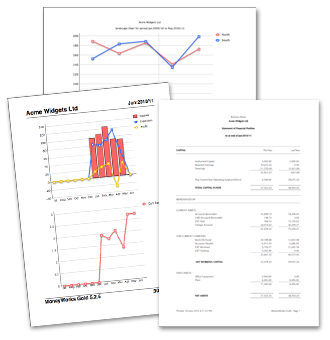 Automatic deployment of plug-ins (custom reports, forms etc). Concurrent client licensing: install MoneyWorks Gold client on as many workstations as you like - only active connections are counted. Server is always available: this makes remote access possible over the internet. Mix Windows and Mac on the same network: server can also be Mac or Windows. Accelerated server-side reporting. Many reports can be run on the server making them up to 500 times faster for remote clients connected over an internet link. Regular automatic backups and archives can be directed to Dropbox or OneDrive for offsite, cloud backups. Partition users: allow users logging into the multi-document server to see only a subset of documents. Console application for server management. Client updates deployed automatically from the server. Expanded integration options: some third party solutions require a MoneyWorks Datacentre Server. Works well with Citrix and Terminal Server, but these are not normally required. Extremely simple install. No other special server software required. The MoneyWorks Datacentre Console provides a centralised way to easily configure and manage your valuable accounting files, with the option to allow some remote configuration through a browser. Manage automatic backup and archiving. Enable REST APIs for access from remote/mobile apps. Set optional Datacentre passwords for extra security. Store security certificates and enable SSL security. Enable Datacentre management through browser. Check for, and install, Datacentre updates. View logging and error information. The single company Datacentre, as its name suggests, serves out a single MoneyWorks file to multiple concurrent users over a network, providing a cost effective multi-user accounting solution. The Datacentre server software can be installed on an always-on PC or Mac in your office, a Windows or Mac server, or on a cloud server such as MS Azure. With all the other benefits of the full, multi-company Datacentre, including fast networking and remote access, the single company Datacentre is available by subscription only. The multi-company Datacentre server provides simultaneous access to multiple company files by multiple concurrent users on demand. It is the ideal solution for organisations made up of more than one legal entity, or for accountants who need to maintain accounts for more than one entity. The server comes standard with 3 concurrent client licenses, and more can be easily added up to a maximum of 99. The Datacentre server software can be installed on a Windows or Mac server, an always-on PC or Mac in your office, or on a cloud server such as MS Azure. Licences for MoneyWorks Datacentre Multi-Company Server are available for purchase or subscription. With MoneyWorks Datacentre you can access your accounts at any time from anywhere1, using your smartphone, tablet, or just a browser on your computer. Included with Datacentre are two example apps that provide ability to do specific tasks, and which can be modified or extended to meet your mobile access requirements. Timer: For job management in the field: enter time and materials against jobs; mark jobs as complete; see newly assigned jobs. Reports: Authorised users can view almost any (authorised) report at any time, including financial reports, dashboard reports, and sales reports. Stash a local copy of customer and product database so can work off line. Live update of customer information changed on mobile device. 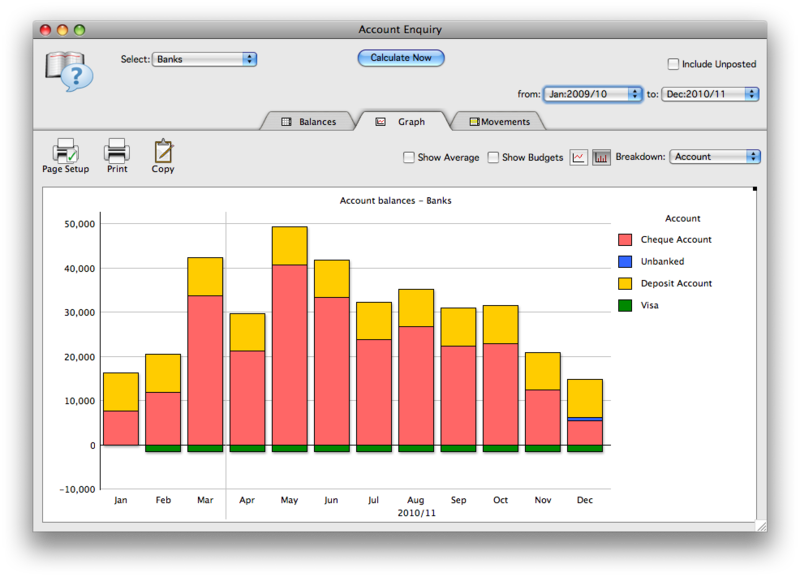 Customer dashboard, showing balances, historic transactions, and any invoice. Input and submit new quotes/orders/invoices. FileMaker Go is free to deploy, and is available from the App Store. 1You will need a static IP address and some configuration of your router/firewall. REST and Command Line APIs enable extensive integration with other systems. These can be either local or remote (mobile devices, external databases etc). REST APIs allow access from remote devices (tablets and smart phones), and also web apps and websites. Authorised Websites can directly interrogate and update MoneyWorks data. Command line access allows integration with backend services using tools such as PHP or Perl. Open source Perl module available. mwScript, the built-in scripting language, can access other data sources and websites. MoneyWorks provides the best possible support for sales tax. 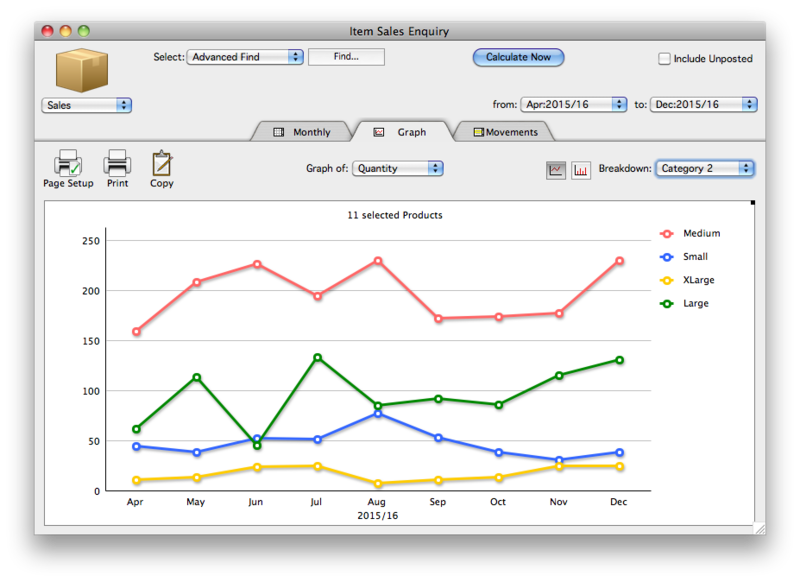 Automatically manage your sales tax. 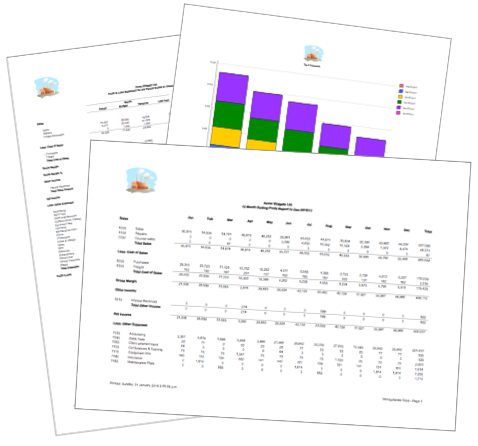 Comes with Trial Balance, Income, Cashflow, Sales Tax, Cash Projection, Ledger and Balance Sheet, plus profit, trading, inventory, sales, job and budget reports. Then take a look at MoneyWorks Now.